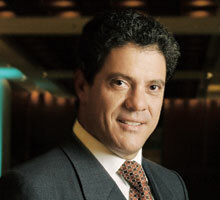 Roger Agnelli, CEO of Vale, photo by revistaepoca.globo.com. RIO DE JANEIRO – Brazilian Mining Giant Vale has confirmed the existence of hydrocarbon in the Vampira offshore well, in the BM-S-48 block of the Basin of Santos. The company holds 12.5% of the consortium for the concession of oil extraction, along with the responsible operator Repsol (forty per cent), state-owned Petrobras (thirty-five per cent) and Australian Woodside (12.5%). After preliminary analyses, two samples taken at the end of July 2009 at a depth of around 4,800 meters proved the presence of light petroleum and rich gas in the area. However, information about the quality of hydrocarbon contained in the block will only be available after test results. Further drilling operations in the Vampira offshore well are set to resume in September 2009. Natural gas extraction is part of Vale’s strategic plan to diversify and optimize its own energy resources, in order to reduce cost and risk. Over the past two years, Vale has entered several oil and gas extraction consortia in the country’s energy basins to identify eventual Natural Gas deposits in Brazil. Vale’s exploration operations started in 2007, when its representatives actively presided over the ninth ANP (National Petroleum Agency) concession auction. The corporation entered nine block consortia for oil and gas extraction in the Basins of Santos, Pará-Maranhão and Paranaíba. In 2008 and 2009, Vale entered several extraction blocks by establishing partnerships through negotiations with companies including Shell, Repsol, ENI and Woodside. In 2008, the mining company bought PGT (Petroleum Geoscience Technology), a geology consulting company for oil and gas drilling, granting itself access to an important source of gas extraction technology. In May 2009, Vale announced the discovery of the Panoramix offshore well, which represented the company’s first success in gas exploration operations in Brazilian waters. In June 2009, Vale’s CEO, Roger Agnelli, signed a series of agreements with Petrobras that grant priority to the mining company for the acquisition of a share in three more extraction blocks of the BM-ES-22 area, just off the Northern coast of the state of Espírito Santo. According to the agreements, Vale will be entitled to a twenty-five per cent share of gas extraction in those blocks. Vale’s current exploration portfolio numbers twenty-six blocks and is held by sixteen concessions: seven in the Santos Basin, three in the Espirito Santo Basin, four in the Pará-Maranhão Basin and two in the Parnaíba Basin. In two years, the company has managed to build a portfolio that predominantly focuses on verified high potential areas, like the Santos Basin and the Espírito Santo Basin, exploration frontiers in the ocean, such as the Pará-Maranhão Basin, and on land with the Paranaíba Basin. The large and varied portfolio led the mining company to benefit from three relevant findings in two years: Belmonte, Panoramix and now, Vampira. A press release from the mining company shows that Vale is undoubtedly one of the biggest shareholders of the oil and gas exploration blocks of Brazil. In 2008, the company invested an impressive US$116 Million in natural gas exploration. In the first semester of 2009, they invested US$72 Million, however by the end of the year the total investment will probably total US$261 Million.